Al-Marri entered his guilty plea at a hearing this afternoon before Judge Michael M. Mihm in U.S. District Court for the Central District of Illinois. 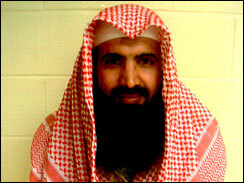 In so doing, al-Marri admitted that he agreed with others to provide material support or resources to al-Qaeda in the form of personnel, including himself, to work under al-Qaedas direction and control with the intent to further the terrorist activity or terrorism objectives of al-Qaeda. "Ali al-Marri was an al-Qaeda sleeper operative working on U.S. soil and directed by the chief planner of the 9-11 attacks. Al-Marri researched the use of chemical weapons, potential targets and maximum casualties," said Arthur M. Cummings, II, Executive Assistant Director of the FBIs National Security Branch. "The investigation that disrupted his plot began with tips from local police partners. The investigation that followed took the FBI agents and task force officers around the globe to develop the intelligence to prevent any potential attack and the evidence to bring al-Marri to justice." "Ali al-Marri today admitted that he traveled to central Illinois as an al-Qaeda operative the day before the Sept.11, 2001, attacks to plan and prepare for future acts of terrorism within the United States," said Jeffrey B. Lang, Acting U.S. Attorney for the Central District of Illinois. "Al-Marris admissions, in open court and after again being advised of his right to a jury trial, confirm the many details of the governments findings as a result of the exemplary investigative efforts by the FBI and other agencies." Khalid Sheikh Mohammed and al-Mari also used a pre-arranged code to disguise their email communications. The pre-arranged communication method referred to Khalid Sheikh Mohammed as "Muk." Al-Marri was to refer to himself as "Abdo" in these communications and to send emails to HOR70@hotmail.com, an email account used by Khalid Sheikh Mohammed. Through these emails, al-Marri was to keep Khalid Sheikh Mohammed apprised of his efforts to enter the United States, his contact information and his efforts to advance al Qaedas mission in the United States. Khalid Sheikh Mohammed was to use these emails to pass on instructions to al-Marri. Details of the prearranged code were stored in an address book that was found in an al-Qaeda safe house in Pakistan. The book contained the email address to be used by al-Marri, which was listed as farwaa@yahoo.com , along with the identification number for al-Marri of "038." From this coded information, al-Marri used the email address of farwaa72@hotmail.com. The address book also listed Khalid Sheikh Mohammeds email address as HOR70@hot[mail.com]. From approximately June 2001 through August 2001, al-Marri communicated via email with Khalid Sheikh Mohammed, as directed and agreed upon, about his attempts to gain entry into the United States via a student visa from Bradley University in Peoria, Ill.. He applied online to Bradley University using the same email address he used to communicate with Khalid Sheikh Mohammed. To expedite his admission, he applied for a second bachelors degree instead of a masters degree. The case is being prosecuted by Trial Attorneys Joanna Baltes and Sharon Lever of the Counterterrorism Section of the Justice Departments National Security Division, and Assistant U.S. Attorney David E. Risley of the U.S. Attorneys Office for the Central District of Illinois. Assistant U.S. Attorney Kevin F. McDonald of the U.S. Attorneys Office for the District of South Carolina also provided critical assistance. GOOD! Now Lock him up and throw away the key! On Jan. 22, 2009, the President directed the Attorney General to lead an interagency review of the case involving al-Marri, who had been detained as an enemy combatant by the Defense Department since June 2003. Weird. 2 days in office and Uhbama wants an obvious terrorist's case reviewed - for possible release? Why so fast? Weird. Thanks to ButThreeLeftsDo for the ping to this thread. A U.S. Air Force psychologist described an al-Qaida sleeper agent as a sometimes kind, respectful man who nonetheless would attack the United States if given a chance. The psychologist testified during the first day of a sentencing hearing for 44-year-old former Bradley University graduate student Ali al-Marri, who has admitted training in al-Qaida camps and having contact with those involved in the Sept. 11 terrorist attacks. The second and what is scheduled to be the final day of al-Marri’s sentencing is Thursday in U.S. District Court in Peoria. The Qatar native faces up to 15 years in prison after pleading guilty in May to one count of conspiring to provide material support or resources to a foreign terrorist organization. BUMP and thank you Piasa. SNIPPET: “A Qatari diplomat was going to visit a convicted member of Al Qaeda when his suspicious behavior led the U.S. to scramble F-16s, sources said Thursday. Mohamed Al-Madadi, the third-ranking diplomat in the Qatari Embassy, was on his way to visit Ali Al-Marri in the Florence, Colo., Supermax prison. Al-Marri, a Qatari citizen, is serving an eight-year sentence after pleading guilty to conspiring to commit a terrorist act. Al-Madadi was scheduled to meet with Al-Marri at 11 a.m. Thursday, said Alison Bradley, a spokeswoman for the Qatari Embassy. Al-Madadi was apprehended by two U.S. air marshals after he spent a suspiciously long time in the airplane bathroom and possibly joked about igniting a bomb in his shoes, congressional sources said. The government scrambled F-16 fighter jets and escorted the plane to the Denver airport. Guy’s family is well connected and heavily involved in the shariah banking biz of Qatar.